Athletes have been trying to improve their athletic performances since the beginning of time. In the process, countless training methods have been tried, tested and systematically researched, which have produced legitimate evidence-based training methods. Evidence has shown which workouts an athlete can handle and at what point an athlete needs rest in order to reach his or her full potential without entering into a phase of over-training or getting injured. Those who don't run according to a training plan can't profit from the research done and are more likely to put in more effort and come out with less than desired results. Successful training demands a good balance between workouts and recovery. This is the only way an athlete will be able to reach his/her peak performance on race day. A training plan takes both the athlete's goals as well as training expertise into consideration. A training plan from VICSYSTEM tells you exactly what sort of run to do and which supplemental exercises to carry out. VICSYSTEM gives you training details on pace, intensity, time, and heart rate. You can decide on which days to train and always reschedule when necessary. Depending on the daily feedback you give, VICSYSTEM will re-calculate your new training zones for certain runs as well as adapting it to your race plans. VICSYSTEM keeps track of your pulse and then updates and incorporates this information into your training plan. The VICSYSTEM has several options for viewing the training plans. For example, you can view today's training, previous trainings, or upcoming training days as well as weekly, monthly and yearly overviews. A print option is also available for all types of overviews. Training Regulation Through Your Personal "Profile"
You can provide information about yourself and your athletic performance and/or condition on your profile, which VICSYSTEM will then use in order to appropriately evaluate you. Training Regulation Through a "Lactate Threshold Test"
If you happen to have done a lactate threshold test, these results can of course be used to your benefit through the VICSYSTEM in order to more precisely adapt, specialize, and personalize your training plans. Training Regulation Through Your "Racing Schedule"
You can share your goals and intended race plans with VICSYSTEM. By making your plans known, VICSYSTEM can then take the information into account and can plan your training accordingly. With VICSYSTEM, you can choose the days on which you wish to conduct the suggested training; although, you should at least set three days aside to train. Of course these settings can be changed at any time in order to adapt to your personal schedule. The VICSYSTEM will then automatically adjust your training plans for optimal results. You choose which days you want to train according to your personal schedule. Here you see the suggested training and which trainings you actually conducted. 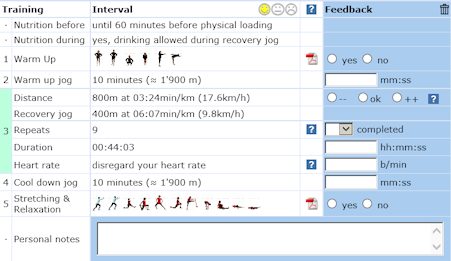 On VICSYSTEM, you can see when you have a hard training period, an approaching race or when you "get" a recovery week.